Xenical works in your digestive system to block one-third of the fat in the food you eat from being digested*. 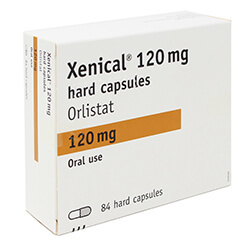 The usual recommended dose of Xenical 120mg is to take one capsule three times a daybefore, during or up to one hour after each main meal. If you miss your meal or have a meal low in fat, you should not take your dose of Xenical pills. The active substance is orlistat. 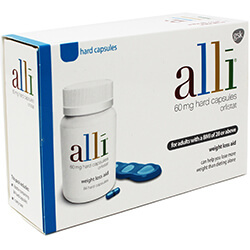 Each capsule contains 120 mg of orlistat. The other ingredients are microcrystalline cellulose (E460), sodium starch glycolate (type A), povidone (E1201), sodium laurilsulfate and talc. The capsule shell consists of gelatine, indigo carmine (E132), titanium dioxide (E171) and edible printing ink.